As the inauguration comes to an end. I sit in my living room wondering what tomorrow will bring for America. I have to say that I am hopeful for tomorrow. What a moment in history to be a part of. As I watched the inauguration, I was on Twiter and Facebook reading what others had to say as well as adding my own two cents. It was amazing to read what people were saying. My only down moment was reading the remarks of those who just could not let go of their politics for this historic moment. This moment will NEVER happen again. Take it in. Revel in this moment. Ok, so I have said my peace. So what did President Barak Obama say to use in the speech? 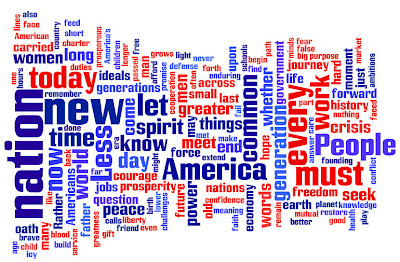 I used Wordle to see what the big words of his speech. Its too early to really be able to tear this speech a part but what do you see? Just a little year in review humor. Happy New Year. I hope your holidays were great!